Finding the best enduro mountain bike is all about versatility. Enduro racing is a mixed bag, sometimes encompassing all mountain biking disciplines in one ride. From the timed downhill sections to the uphill climbs, to the cross-country treks–enduro racing is known for mixing it up. Since the course could throw anything your way, you need to equip yourself with a bike that can handle it. Choosing the best geometry and mix of features is key for enduro racers. Typically, enduro racers want ‘All Mountain’ bikes, which are designed to handle a multitude of terrains. Perhaps most importantly of all, you want a strong frame. Something that will withstand the gnarly terrain that you’re most likely to encounter on an enduro trek. Whether you have a shoestring budget or money to burn, there is a quality enduro bike right for you. Below are our top enduro bike picks and a helpful buying guide to give you some more guidance in choosing the perfect ride. If you’re looking for a high-quality bike, look no further. The BEIOU ultralight hardtail bike is an all-around solid choice–literally. Its lightweight frame is made with incredibly durable Toray T800 and T1000 carbon fibre with a tensile strength is 500kgf/mm2. Despite its strength, this hardtail is delightfully light, making it a cinch to carry between the timed sections on your enduro race. Other winning features include a spectacular set of Shimano hydraulic disc brakes, giving you superior stopping power, and a pair of professional grade Maxxis 27.5-inch tires with both manoeuvrability, traction and terrain coverage. For just more than $1,000, this BEIOU offers a shocking amount of professional grade features. For those wanting even more, this bike is still a great option as riders can customize it with advanced components. For example, serious riders may want to invest in some even better tires. 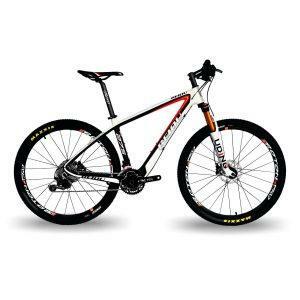 Because this bike features such a high-quality frame, purchasing upgrades for it still is a more cost-effective option. The frame’s tensile strength alone should be enough to push it to a higher price point. If you have the money to spend, there is really no better value than this bike. 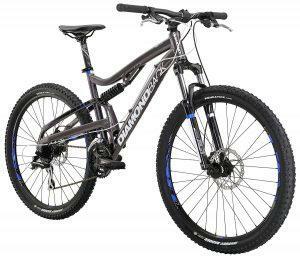 Simple, smooth and stable–the Diamondback Recoil mountain bike provides a streamlined and balanced ride. Harnessing the power of a single pivot suspension system, this Diamondback rig provides a smooth ride for enduro riders on particularly long, bumpy trails. By default, this full suspension system will be a bit more nuanced than your average hardtail bike– meaning the potential for more complicated repairs–but after one ride on the Recoil, you’ll soon realize it’s worth it. The suspension system provides a sweet 4 inches of travel, ensuring a plush, more comfortable ride. While it’s not quite as light as the BEIOU carbon fibre frame, the Recoil still offers extreme durability. The 6061-T6 aluminium frame is built from butted and formed aluminium tubing. The noticeably solid frame, combined with the 4 inches of travel, provides a sense of stability found in top-tier bikes costing in the several thousands of dollars. We’d be remiss if we didn’t mention the Recoil’s particularly simple gearing and braking systems. The Shimano 8-speed shifter is top of the line, ensuring smooth gear transitions no matter how fast or steep your ride may be. Lastly, the neutral geometry of this enduro-friendly bike is exceptional. Diamondback is known for its great designs, and the Recoil is no exception. 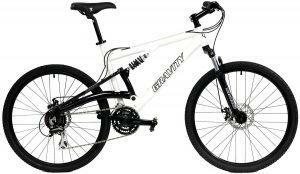 The neutral geometry makes it suitable for both uphill and downhill treks. We recommend the Recoil for enduro racers looking for a quality ride with a mid-tier price tag. For first-time enduro racers looking for entry-level prices, there’s no better bike than the Gravity FSX. This $320 bike features a surprising amount of excellent features. Most notably is its single pivot, dual suspension system, similar to that of the Diamondback Recoil, but at a lower price. The hydroformed aluminum frame will provide more than enough strength and durability for entry-level enduro riders opting for less intense trails. Another great feature is the adjustable front and rear shocks. This is particularly useful for beginning enduro riders who aren’t serious competitors and still want to use their bike for more leisurely cross-country rides. The 24-speed Shimano shifter is another high-ticket feature not typically found on budget bikes. While the 24-speed will not be as smooth as the 8 speed, Shimano shifters are the best in mountain bike gearing systems so you can rest assured that you will have easy gear transitions on steep climbs and at high speeds. Adding to the value of this bike is its quick and easy assembly. Most anyone could assemble from the box, eliminating the need for a trip to the bike shop, which can sometimes result in expense assembly charges. Obviously, your budget and skill level will determine much of your decision, but you still need to weigh your options before buying. Below are some key considerations. Every enduro race is different. Every course will be new, uncharted territory with turns, drops, jumps and obstacles that you aren’t used to. While you’re busy preparing yourself mentally for these surprises, you don’t want your bike to be another variable you need to juggle while you’re paying attention to the course. Ideally, you want a stable ride that feels the same every time. Forget about glitchy gear systems that sometimes jerk under pressure or tires that lose pressure after every sustained ride. The best way to ensure quality features is to buy bikes that use tested, name-brand components with overwhelmingly positive track records. For example, our bikes listed feature Shimano gearing systems because Shimano knows what they’re doing. You can count on smooth, easy gear transitioning from pretty much all of their products. This goes for anything you want to add to your bike as well. Choose components with solid, reliable performance over flashy new technology. Once you choose a bike, be sure to ride it several times before taking it to your first enduro race. You need to feel totally comfortable on your bike before you tackle new terrain. Despite their variability, there are two things nearly all enduro races will have: uphill climbs and downhill descents. Very few enduro courses will be flatline so you can practically peaks and valleys. Usually, bikes are tailored to either downhill or uphill riding–not both. You want to make sure your bike’s geometry is neutral to give you stability throughout the ups and downs. Also, a quality braking system is key on steep descents and a smooth gearing system for uphill climbs. If you can’t find the right balance, then you should focus on whichever is your strength. If you are a downhill adrenaline junkie, choose a bike with slacker head tube geometry and a lot more travel to help absorb those intense downhill shocks. Ideally, you want a bike to handle both up and downhill, but if that’s out of the question then playing to your strengths as a rider is always a good idea. Your bike is bound to take a beating during an enduro race, and you don’t want to take a beating with it. You need a strong, stable frame that will support you during those rugged, rock-filled races, not crumble beneath you. The potential to hurt yourself in an enduro race is no joke. Taking a poorly-made bike with a flimsy frame onto an enduro course is asking for a serious injury and a busted bike. You should really stick to carbon fibre and aluminium frames, as they are both light and very durable. However, carbon fibre designs can vary greatly. Poorly constructed carbon fibre frames can snap in an instant so you want to buy from a company that can prove the strength of its technology. At the very least, look for user reviews of your chosen carbon bike to ensure other riders can vouch for its durability. Our top pick–the BEIOU ultralight hardtail–is one that is both user tested and company tested. You can rest assured the carbon fibre frame will sustain serious jolts and jumps. Aluminium alloy is a more affordable and standard choice, and you can almost always rely on an aluminium frame. You want to make sure your aluminium frame is formed and butted for increased stability. Enduro biking can be an absolute blast. The variety in courses combined with the thrill of competition will satisfy every person’s inner adventurer. Even if you don’t plan on taking your new ride on any enduro courses, an enduro-friendly bike can still be a good choice. It’s able to cover all types of terrain, and most can transition into cross country riding. Any of the three bikes on our list would be an awesome choice for mountain bikers across the board.